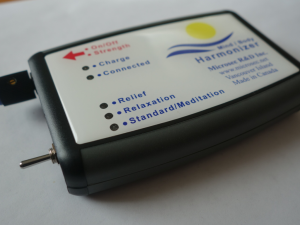 The mind body harmonizer may be used for relaxation and help relieve conditions of stress. The mind body harmonizer may also assist with Meditation and even with Lucid Dreaming. The mind body harmonizer helps increase focus & concentration, attention and mindfulness. Brain Electrotherapy Stimulation (BES), is used in this small, portable electronic device that creates a safe, non-invasive signal that, when attached directly to the earlobes, sends a weak electric waveform to the brain that helps induce a state of relaxation & stress relief. It also helps to improve concentration, reduces Obsessive Compulsive Behaviour, helps with learning and it can assist meditation. I am experiencing positive effects and am totally delighted with my purchase. Helps with sleep, concentration, memory etc. I want you to know that I am pleased with the Harmonizer. I’m coming to the end of my two-week period of using it twice a day. So far I’ve just been using the Standard 40 hertz frequency. I haven’t yet explored the other two. I would say that the greatest benefit so far has been not getting into a negative state that hangs on for hours or days. There must be more firing of the synapses and I now have help in dealing with stress, without all the complexity of trial and error as well as the side effects from medication. I am very thankful I found this device, I feel completely flipped from how I was two weeks ago. From not wanting to get out of bed to happy, healthy and back to my old hobbies. Thank you for this bringing this technology to Canada, I hope others find it as helpful as I have. I use your Mind Body Harmonizer daily with numerous clients. I believe pairing anxiety provoking thoughts and memories with the more relaxed physiology that the device produces, enhances the therapeutic efficacy of our sessions. Several clients have purchased a unit for home use between sessions. I have purchased a few other types of similar units in the past and this is the best quality product at a good price. The multiple settings are also a plus. With the meditative setting seeming the most desirable. I have been able to strengthen my meditation practice through using the Harmonizer, which is why I go it. I had been using a standard CES I ordered through the Swingle Clinic in Vancouver several years ago for general relaxation, and I was satisfied with it for that purpose. But of its 2 settings, neither one helped with meditation as the Harmonizer has done. For this reason, I am glad I got the Harmonizer and consider it money well spent! Do you know of a group who might be interested in learning more about this amazing device? Contact us and we'll help organize an informal informational session that some might find helpful.